Lumaconi what now? Don’t worry, I didn’t know what is was either until I stumbled across it in my beloved Sainsbury’s and thought “that pasta looks like snail shells, I MUST HAVE IT!”… But you can use any shape of pasta you like, normally I’d use wholewheat but I’ve had a crappy week so thought I’d go wild and treat myself. I know, I’m out of control. I actually make this meal a lot during the week because it’s healthy, easy and versatile, like a Birds Eye Potato Waffles. Okay so maybe not THAT versatile but I do like to turn this meal into a delicious pasta salad the next day. Also, I think it’s worth noting that I find the humble courgette, the soggy wet blanket of all the cooked vegetables, that’s why I prefer to grate it. A cold pre-cooked courgette makes for a rather unpleasant slimy pasta salad situation. 1. Chop your onion, half the red chilli, garlic and soften in a pan with a bit of spray oil on a medium heat. Once the oil has absorbed fry in a bit of water until soft. Grate your courgette and add to the pan along with the spring greens. Season well and keep adding a bit of water to keep the ingredients moist (sorry, gross word but necessary). 2. Boil the kettle and add it to around 140g of pasta. I like my pasta really soft like an old woman with no teeth but if you prefer it al dente then follow the packet instructions. 3. Whilst your pasta and greens are cooking half your olives and chop the mint, feta and the rest of the chilli. By the time your pasta is cooked your greens should be done so take them both off the heat and drain your pasta. Pour straight into the saucepan with the greens and mix well. 4. Finally top with the mint, feta, olives and chilli and combine as best you can without getting it all over the floor… No, that didn’t happen to me and no I didn’t get a dog hair in my mouth when I ate a pasta shell off the floor… I need a bigger pan. 5. Pour into a bowl, sprinkle with chilli flakes and a drizzle of extra virgin olive oil. 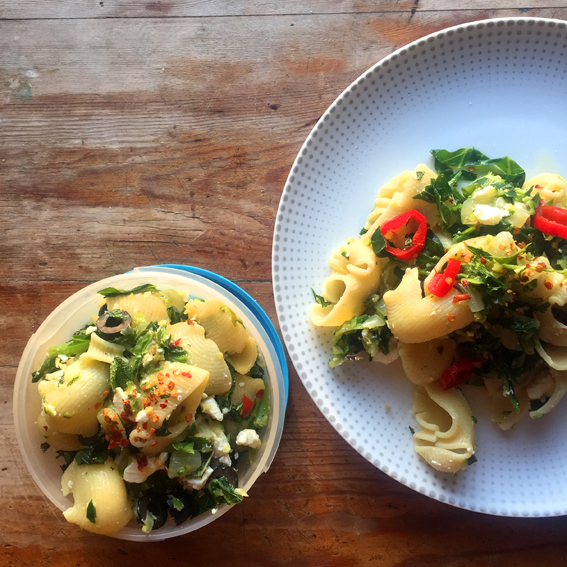 PASTA SALAD: I’ve saved half of my pasta to turn into pasta salad tomorrow, this is how you make it… Take your refrigerated pasta, put it in a big bowl and combine it with half a packet of rocket and chopped avocado. Pour onto a plate, drizzle with avocado oil and a sprinkle of chilli flakes. Serve with a dollop (or half a tub) of houmous. You don’t have to use avocado oil but I think it tastes better if you do. Wouldn’t you know it we have just started harvesting our courgettes, a much needed recipes for the glut to come! Hi. Another good bet for our twice a week veggie days I think. Yesterday I made your black bean chilli. Great! Not quite to your recipe: no chilli flakes so I used the tiny dried chillis; a lot of seeds got in so although I had got a fresh little chilli I didn’t use it as adding any more would have made it too hot for our taste (pretty hot!). At the final pre-serving taste I thought it a bit bland so added two veg stock cubes. Re courgettes: I make something like a potato rosti but with courgettes instead (bit of onion, garlic and herbs added). It’s a favourite veggie day dish or if it’s ‘veggie’ not vegan then a poached egg on top is great. Adding a couple of stock cubes is a great idea, will try that next time I make it. Also, I’ve heard adding coffee to chilli works really well so might experiment with that too. Just made it, well almost, spring greens translated to anything that was green and ready in the garden so peas, a bit of spinach that the chickens hadn’t eaten and some basil. No olives, they don’t grow here, dried chilli as ours haven’t grown yet, fresh made pasta and rapeseed oil, but other than that the same 🙂 Thank you for the inspiration we have 6 (small) less courgettes to deal with now and I can’t wait for the cherry tomatoes to ripen as I think they would go well with this dish.